The Indians of Towns hosted George Walton Academy in game one of a scheduled double header on Saturday morning. With the season drawing near an end, every game is another opportunity to get a victory. George Walton took advantage of being the visiting by stepping to the plate and dropping 7 runs quickly in the top of the first and adding 2 in the second and 7 more in the third in the 16-0 victory over the Indians. In the loss to GWA, pitchers Abby Mauldin and Natalie Smith combined over the 4 innings to allow 16 runs(10 earned) on 9 hits. The pair threw 133 pitches and put 9 batters on base by walk. In the shut out victory by George Walton Lea Neumyer had the only hit(first inning) in the game for Towns. Neumyer also reached on an error.The GWA pitcher struck out 10 batters in the game. 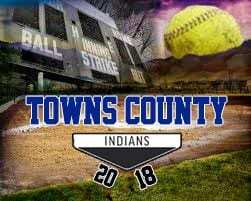 The Towns County Lady Indians were scheduled to play game 2 of the doubleheader shortly after game 1. No score for the second game was available at the time of the article..